SANTA CLARA, Calif.--(BUSINESS WIRE)--In the list of hyperlinks following the tenth paragraph of release dated June 24, 2016, the first hyperlink should read http://malwarebytesracing.com (instead of https://www.malwarebytesracing.com). 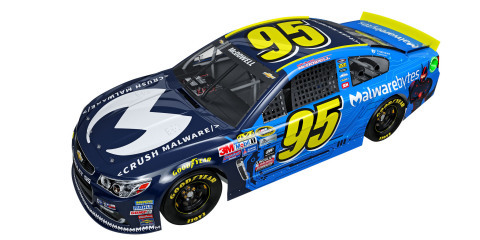 Malwarebytes™, the leading advanced malware prevention and remediation solution, is now protecting and partnering with Circle Sport-Leavine Family Racing (CSLFR), a NASCAR racing team fielding the No. 95 in the Sprint Cup Series. The team recently fell victim to ransomware, where a crucial subset of data was held hostage. The company turned to Malwarebytes in the wake of the attack, and now deploys Malwarebytes Anti-Malware on all company computers to protect its data. As crew chief, Dave Winston manages all track data from races, as well as data from test facilities and personnel information. Computers, all of which held Winston’s data, were recently infected by TeslaCrypt ransomware and the perpetrators demanded that the CSLFR team pay a ransom within 48 hours, or their data would be gone forever. The track data taken hostage contained key information that the CSLFR team had to ensure that their race cars perform at their highest level, car part lists, and custom high-profile simulation set-ups valued at $2 million. To recreate this data, it would have taken the team nearly 1,500 man-hours. In the wake of the attack, the CSLFR team was advised to look into using Malwarebytes to remediate any leftover instances of infection, and protect itself for the future. After working overnight to find bitcoins to pay the ransom and recover their files within 48 hours, Dave Winston and his team decided on Malwarebytes, which they were told could have prevented this attack. After running and installing Malwarebytes Anti-Malware, the company found and eliminated additional instances of malware infection from over 10,000 files. Now, the company is protecting all of its company data with licenses for Malwarebytes Anti-Malware. The threat of ransomware is growing rapidly. Instances of ransomware in exploit kits, used to infect web users, have increased about 44 percent in the last six months alone, according to Malwarebytes research data. Malwarebytes and CSLFR have launched a partnership to help educate the public about the very real threat of ransomware to companies of all sizes, and consumers of all kinds. The company will be sponsoring CSLFR at multiple NASCAR Sprint Cup Series races throughout the year. Malwarebytes was drawn to NASCAR because of the size of the NASCAR fan base and their loyalty to sponsors in the sport. For more details on the incident, view our video case study here. Formed in 2016, Joe Falk, owner of Circle Sport Racing and Bob and Sharon Leavine, owners of Leavine Family Racing teamed up to compete in the 2016 NASCAR Sprint Cup Series season as Circle Sport-Leavine Family Racing. The team fields the No. 95 Chevrolet SS, driven by Michael McDowell as well as Ty Dillon in select races. The team operates out of their Concord, N.C.-based race shop with a veteran group of racing personnel and is driven by several core principals including Value, Integrity, Flexibility, Opportunity, Access and Experience. For more information, please visit www.CSLFR95.com.